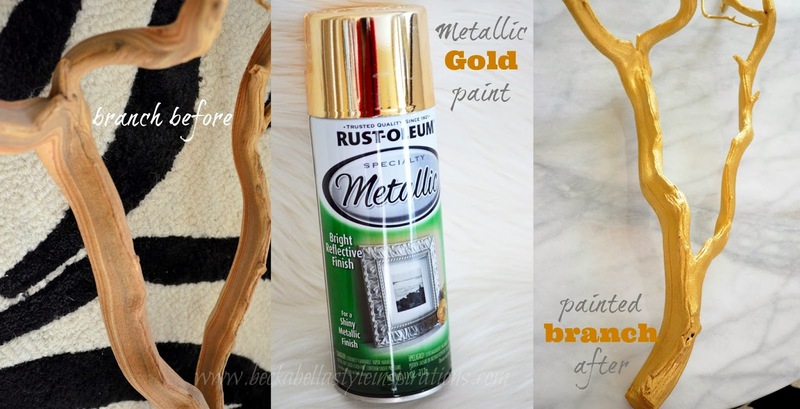 I've been on a gilded gold kick lately as can be seen here in my recent DIY projects...and it's still continuing. If you're like me, always finding yourself craving high luster, gold gilded home decor accessories, trinkets or even furniture, then you might dig these two of my latest quick and very simple projects. These projects are especially practical since gilded branches and sea shells (although these two are reasonably priced) are sold at various decorating stores for such astronomical amounts that I can never in my right mind bring myself to pay what they're asking for them. However, I have always longed to incorporate them in my decor. Thankfully, our house isn't short on sea shells that we've collected over the years living out on Long Island NY, so I decided to revitalize one that had the most intricate details and would really make a fantastic visual impact. Also, recently in my search for a breakfast table and end tables, I stumbled upon this branch at a thrift shop for only $10.00! Add a $4.00 can of gold metallic spray paint, and five minutes of my time later I've got myself one of the most pricey and sought after pieces that I've always wanted. Woohoo!! Simply dust the object and start spraying your paint. It's just that simple. I hope this post inspires you to look at your jars of shells and loose branches out in your backyard in a whole new light. Plus, there's something about spray painting things that just brings such a joy!